In Part Two of The Natural Gardens of North Carolina, B. W. Wells discusses the Madder Family (the Rubiaceae, pg 185). Sometimes called the Coffee Family, for its most famous member, it also includes the Cinchona Tree, whose bark is a source of quinine, and our local Bluets, Partridgeberries, Buttonweeds, and Bedstraws. Sherardia arvensis – Blue Field Madder – is an introduced species resembling and closely related to the Bedstraws (Galium sp.). In the spring and summer, it can easily be distinguished from the Bedstraws by its bright blue flowers, in contrast to the white flowers of the Bedstraws. In addition to flower color, the leaves of Sherardia are more lance-like than the Bedstraws, and come to a distinct point. The leaves grow in distinct separate whorls, also similar to Bedstraws. 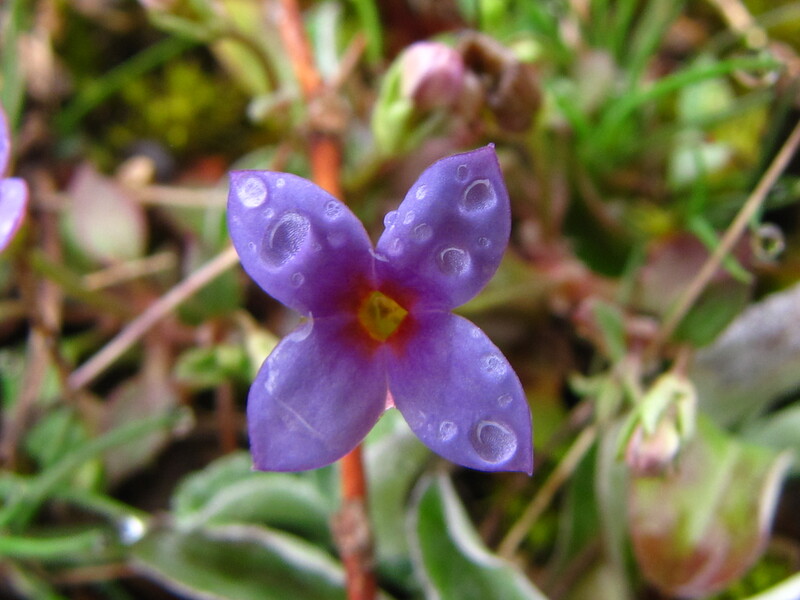 The flowers of Sherardia also resemble some of the Bluets (Houstonia sp.). 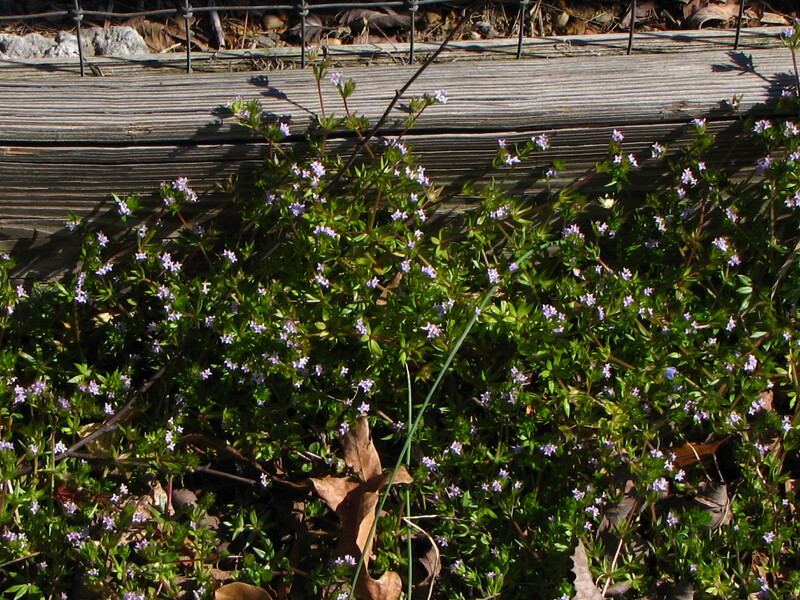 A few blooms of Sherardia are pictured next, followed by a Tiny Bluet (Houstonia pusilla). Sherardia arvensis has long been considered monotypic – the only species in the Genus Sherardia. 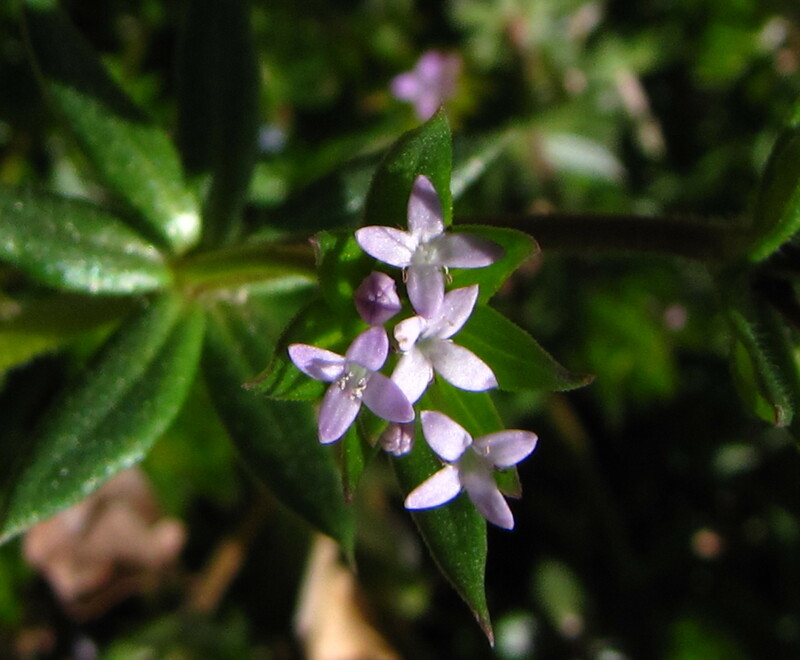 That may be changing, as Weakley’s Flora has recently moved it into the Galium Genus as Galium sherardia. 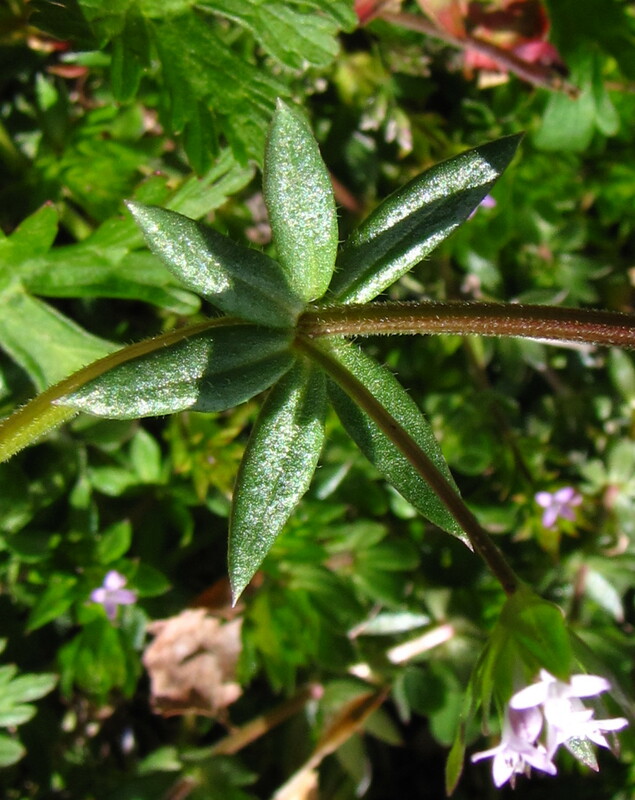 If this reclassification is accepted, Galium sherardia will be one of the least difficult of the Bedstraws to identify. 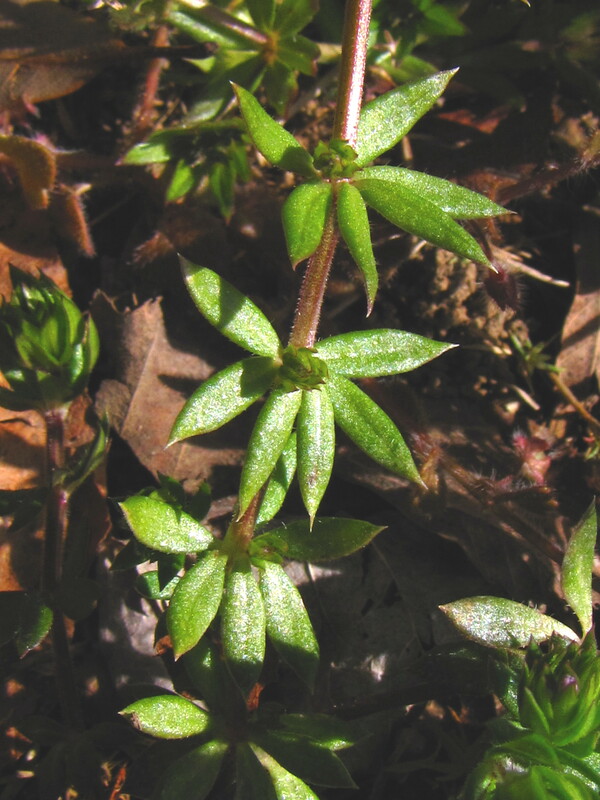 Here is a link to a floristic key to the Genus Galium from the Michigan Flora website: http://michiganflora.net/genus.aspx?id=Galium . 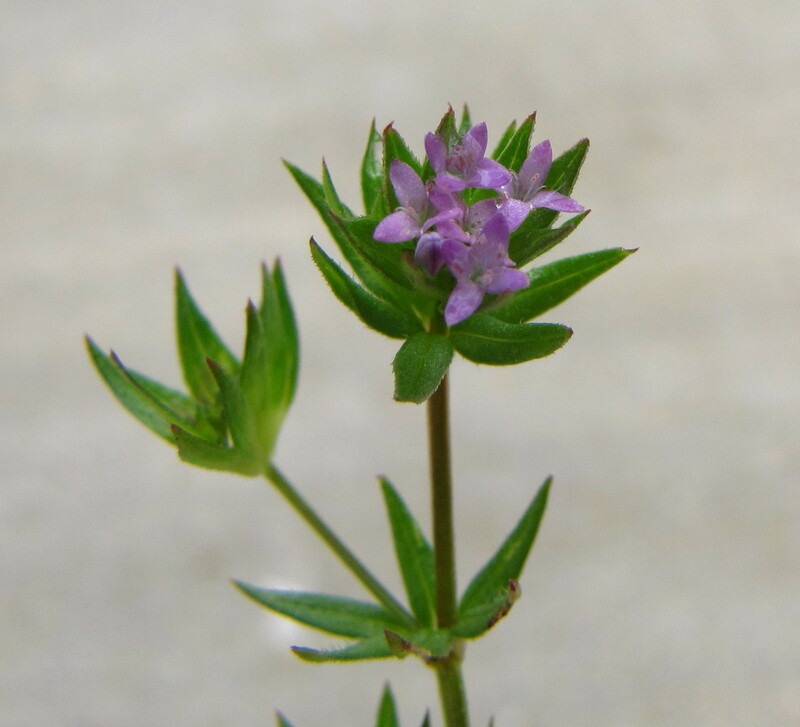 A final photo of Sherardia (or Galium sherardia) hanging out in one of its favorite spots, a driveway crack. This entry was posted in Uncategorized and tagged B W Wells, Bedstraws, Blue Field Madder, Galium sherardia, Galium sp., leaf whorls, Madders, Sherardia arvensis. Bookmark the permalink. The roots of Blue Field Madder have been used to produce a dye, but evidently the color is pink or reddish, but not blue.